All this month – during September 2010 – the queen planet Venus sets in the west as the king planet Jupiter rises in the east. 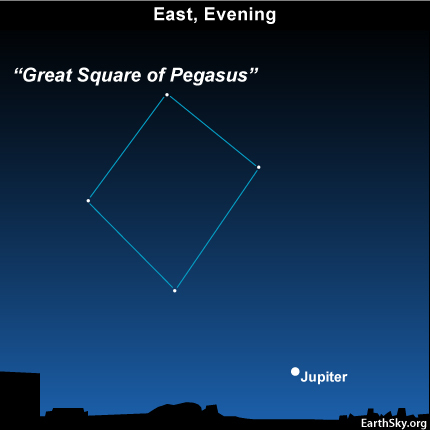 Our chart shows the eastern sky at early evening for mid-northern latitudes, with Jupiter – the sky’s second brightest planet – shining to the lower right of the Great Square of Pegasus. Venus – the sky’s brightest planet – pops out in the west shortly after sunset. As dusk deepens, the star Spica and the planet Mars join up with Venus in the darkening sky. 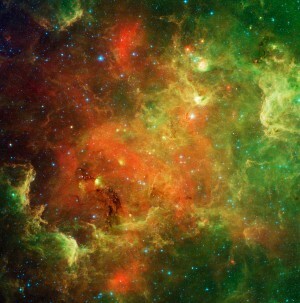 We tell you more about this celestial line-up on our September 1 program. What time does Venus set and Jupiter rise? It all depends on where you live on the globe. At mid-northern latitudes, Venus sets and Jupiter rises at early evening. Farther north, the queen planet sets sooner after sunset, so the king planet also rises earlier. As far north as Alaska, you will not see Venus at all and you will see Jupiter all night long. The farther south you live, the later that Venus stays out after dark. That means a later rising time for Jupiter, too. Once Jupiter rises, however, he is out for rest of the night. On these September evenings, watch for Jupiter to rise at about the time that Venus sets.